Sun Times: This is the first true tablet. Everything else is a laptop with the keyboard removed. New York Times: It’s basically a big iPod touch. The big display is a game changer for some apps. But the on-screen keyboard stinks. TechBlog: It’s not a PC replacement, but it’s an entirely new class of device (with a surprisingly decent on-screen keyboard). Wall Street Journal: You can use it surf the web, send emails, and consume media. You won’t use it for creating large documents. Boing Boing: It will change the way you read books — think “Harry Potter” books with moving pictures. 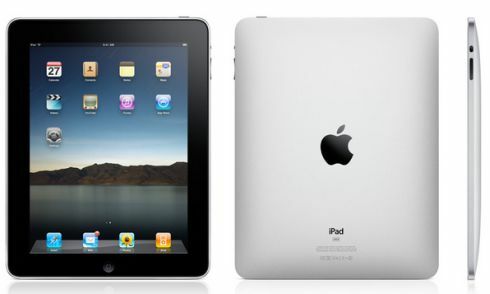 PC Magazine: The iPad is lighter than a laptop, but kind of heavy to hold in one hand for extended periods. ABC News: Hey look, it’s a video! Interestingly, while some reviewers hated the on-screen keyboard, others found it comfortable. The Wall Street Journal’s Walt Mossberg says he preferred it to some netbook keyboards. via Apple iPad review roundup. My personal take on the device it that this is only the tip of the iceberg. See, Apple is now introducing something that all non tech people can finally enjoy using. It is a good enough web browser, video player, music player, digital frame, and wathever else you can do with it via applications on the app store. Make no mistake, this will probably be the best 2D gaming console out there. Nintendo will come up with a 3D DS this year but Apple already patenting a ton of 3D UI concept… so it will get there too eventually. As more and more developers extend the use of the device it will gain the strongest foot hold on the market. The Sony, HP, Dell and Asus wannabe won’t be able to touch Apple application echo system and will ultimately fight for the second place. They will essentially ride the coat tail of Apple success in pushing tablet form factor to the mass. Without Apple I doubt there would have been much attention on tablet for average users. What Apple also did with this release of the iPad is set a level of what the Sony, Asus, etc copy cats need to match/exceed at the same or lower price point… but soon after they release their offering based on Android, Chrome OS or Win7 Apple will come up with OS4 for the iPAD. The new OS version will probably be a paradigm shift in UI that no other tablet vendors will be able to match. They will be left scrambling to catch up.